Well-equipped manufacturing facility has helped us develop a beautiful range of Tray in accordance with the prevailing market trends. Keeping latest market trends in mind, we have been engaged in offering a quality assured array of Bathroom Trays. A team of trained and qualified professionals is hired by us which manufactures these products using optimum-grade material. Also, we customize these trays on the basis of the specifications detailed by clients. SS Corner is an ideal addition to any bathrooms or toilets. Save plenty of space by storing your towels on this wonderful corner. 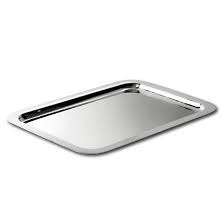 We present to our clientele a wide range of Bathroom Tray, which are made employing the top grade material and advanced techniques.